These expanded indexes of various tribal rolls is transcribed from microfilmed tribal census, rolls, etc. The microfilm is housed in the Archives and Manuscripts Division of the Oklahoma Historical Society, Oklahoma City, Oklahoma. It is also the understanding of the transcribers that copies are also available through the National Archives, Washington, DC, and through various businesses dealing with microfilmed public records. The purpose of these indexes is to assist the genealogical or family history researcher in establishing the possibility that a particular individual may be found on the roll, census, etc. It is not meant to be proof or "the last word", with regard to Native American blood. This book is not all inclusive of information for the years covered. Every effort has been made to make as exact a transcription as possible and no effort has been made to correct obvious differences in spelling, grammar or punctuation. Each document included in this books are alphabetized, rather than being generally alphabetized. G595-$5.00 OTTAWA - Expanded Index of the Ottawa Census, Annuity Rolls and Administrations, by Gregath Company, Inc. ISBN 0-944619-38-X, 5½x8½", softbound book, 18 pages, 1878-1883 with undated material Quapaw Agency, Indian Territory. Also available on disk. 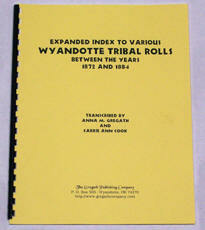 The information in this book was extracted from the 1937 Base Roll of the Wyandotte Tribe of Oklahoma. The following key will be helpful in using this book.